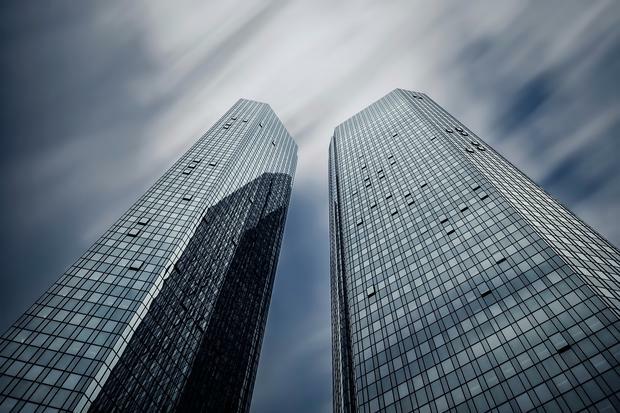 Shares in Deutsche Bank, Germany's largest bank, fell to their lowest level since the 1980s last week as the German government was forced to deny rumours that it was preparing to bail out the stricken lender. It has been a year to forget for Deutsche. In February, it was forced to endure the indignity of German finance minister Wolfgang Schaeuble appearing on Bloomberg TV to reassure nervous investors that he had "no concerns" about the bank's financial health. While Mr Schaeuble may have no concerns, it is clear investors don't share his confidence. Even before last week's fall, Deutsche shares had already lost 50pc of their value since the start of 2016. At the current share price of just under €10, you could buy the whole of Deutsche for just €14bn. This compares to Deutsche's stated book value of just under €62bn at the end of June. The fact that Deutsche's share price is trading at a massive 78pc discount to its book value can only mean one of two things - either Deutsche is an absolute steal at the current share price or, more likely, the bank is facing massive losses that will massively reduce its book value. The US Justice Department is proposing to fine Deutsche $14bn [€12.5bn) for misselling mortgage-backed securities before the 2008 crash. Even if Deutsche can negotiate a reduction in the amount of this fine, most investors are convinced that it will have to raise fresh capital in order to settle with the Feds. The US fine comes on top of after-tax losses of €6.8bn in 2015. Deutsche barely broke even in the first half of 2016, recording after-tax profits of just €256m in the six months to the end of June. Commerzbank, Germany's second-largest bank, is also in the wars after announcing last week that it is scrapping its dividend and firing almost a fifth of its 51,000 staff. So why should the woes of the German banks concern us in this country? After all, we received scant sympathy from our German 'partners' when the Irish banks hit the buffers in 2008. While the temptation to feel a certain schadenfreude at Germany's expense is hardly surprising, we will all feel the pain of the emerging German banking crisis. Deutsche employs 650 people in this country while Commerzbank also has a major IFSC presence. The woes of the German banks is one of the major reasons the Euro Stoxx index of leading European bank shares is down 30pc since the start of the year. Not alone has the fall in bank shares shaved €700m off the value of the Irish Government's remaining 14pc stake in Bank of Ireland, it has also put the kibosh on its plans to sell down some of its 99.8pc AIB shareholding. The German banking crisis comes at a time when the problems of other European countries, most worryingly Italy, have also worsened. While Mario Draghi's aggressive quantitative easing, with the ECB buying €80bn of bonds every month, may have staved off a Eurozone collapse, it has had some extremely negative side-effects. The ultra-low, in some cases even negative, interest rates generated by QE have made it extremely difficult for all European banks to make a profit. Extremely low interest rates have also scuppered the traditional mechanism by which governments surreptitiously recapitalised their banks after a bust - with the banks using their deposits to buy bonds and lend risk-free at a healthy margin to the government. However, the German banking crisis may not be all bad news. The EU Commission and the ECB, strongly backed by Germany, have been at loggerheads with Italy over that country's plans to bail out its banks. The squabbling continued last week with the head of Italy's bank rescue fund describing the resolution process being pushed by Brussels, Frankfurt and Berlin as "absurd". With an estimated €360bn of bad loans - about a fifth of their entire loan books - most of the major Italian banks need to raise fresh capital. With Italian bank shares on the floor, the share price of the largest Italian lender Unicredit is down by almost two-thirds since the start of the year - this fresh capital can only come from the government. The ECB and the Commission want Italy to follow the example of Cyprus in 2013 and "bail in" (that is, impose a haircut) depositors as part of any bank rescues. The Italian government is fiercely resisting these demands. Further complicating matters is the constitutional referendum scheduled for December 4, which has become a proxy vote on the Italian government's economic policies. A 'no' vote could trigger an early Italian general election, with opinion polls showing the opposition Five Star Movement, which has promised a referendum on Italy's euro membership, running neck and neck with the governing Democratic Party. Will a domestic banking crisis and the need to bail out its own banks soften Germany's resistance to Italy's bank rescue plans? Deutsche and Commerzbank's problems could yet turn out to be the proverbial cloud with a silver lining. Stefania Spezzati and Harry Wilson Royal Bank of Scotland's top banker is to leave within a year, in an expected move that potentially paves the way for a senior female executive to take his role. The bank will start searching to replace Ross McEwan as CEO immediately.